A love for Texas has been a staple in Cade's upbringing. Family dove hunts, spanning three generations, in Hamilton was a fixture as far back as he can remember. His connection with Texas was deepened with frequent visits to the library with his grandfather to look up the Baxter lineage in Texas history. 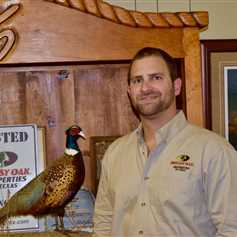 Aside from hunting deer, duck, dove and turkey, Cade grew up playing baseball which eventually lead to his graduating from Angelo State University. He left San Angelo with a degree in real estate/finance and with the hopes of joining the Mossy Oak Properties of Texas team. By his own admission he has been blessed to have his dream job and is prepared and excited to bring his passion and experience in land sales to the table to provide other land lovers with their own piece of Texas.